CAIRO – A million people headed out to protest on the streets of Egypt's cities Tuesday, creating a spectacle that far surpassed any protest in the country's modern history. After the large turnout on the eighth day of protesting, President Hosni Mubarak announced that he would give a speech Tuesday evening. Al Arabiya TV reported that Mubarak will say that he will step down at the next election but would stay in office till then to meet demands of protesters in that period. In addition, US President Barack Obama's special envoy Frank Wisner delivered a message to Mubarak about the need to prepare for an "orderly transition" of power in the country, a US official said. Meanwhile protesters are calling on Mubarak to resign, and even to leave the country. Military forces deployed in Cairo's main streets, blocking the entry of vehicles, especially to the area of Tahrir Square. 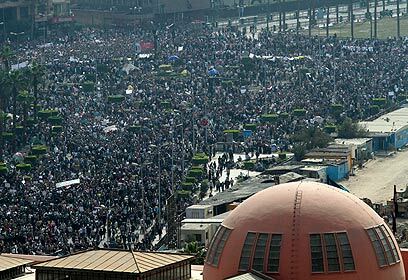 Around a quarter of a million people gathered in the square on Tuesday afternoon, calling for a "million man march" against the regime. Al-Jazeera reported that the number of people is currently somewhere around 2 million. An additional 20,000 are protesting in the city of Suez, and similar protests are also taking place in Alexandria, Ismailia, and others. "Mubarak, awake up! Today is your last day!" cried protesters in Alexandria. Meanwhile some 200 activists protested Tuesday evening before the Egyptian embassy in Tel Aviv in an expression of solidarity with the country's opposition parties. The protesters, Jews and Arabs, waved signs condemning Egyptian President Hosni Mubarak, one of them displaying his head on a donkey's body. Others had Palestinian, Egyptian, and Tunisian flags. Other signs praised former Egyptian president, Gamal Abdel Nasser Hussein. Another sign said, "It's time for the tyrannical regimes to depart from the world". The protesters also condemned Israel. "Nasser wanted an intifada, say no to a peace agreement with Israel," some cried. "If the people rise up they will win." Police are on the scene, and earlier a photographer and embassy worker clashed when the latter tried to prevent the former from photographing the building. "We commend the revolution in Tunisia. The Arabs want democracy. We call for revolutions in the entire Arab world – no more oppression and no more murder," one protester at the scene said. See all talkbacks "A million people protest in Egypt"